Why are we still using straws...? I don't know if it's just me, but I have never had the desire to use one. I have always sipped my drink straight from the glass. I don't order soda at restaurants nor do I order cold drinks at coffee shops, maybe that's why I don't come across them as much as the folks in this video? I was told once as a youngin' that sipping straws increases mouth wrinkles, not sure if that is true, but the logic is sound, right? I have heard some folks say that straws lessen the coolness of the beverage so it is less of a shock on their teeth or that the ice on top of the beverage waters down the liquid, so sipping from the bottom of the glass ensures the full taste of the drink, or folks drink coffee and tea with straws as to keep their teeth white...sure whatever, let's go with these. Enough about my perfect straw-less history, let's talk solutions for those of you who like straws. Glass straws, like the ones featured in this video are a great alternative. Most are tempered, heavy duty glass like a pirex dish. They won't snap in half or chip as long as you take care of them like your other glassware. Now, glass is not necessarily the most sustainable as we is come from sand, a natural occurring element. What happens when we are out of sand...? It's worth it to check out their site, maybe they have a secret? Bamboo is another option. Natural and portable, but hand wash only. You can find some at Package Free Shop. But, we run into a similar issue with sourcing the bamboo. Unless it is grown and harvested without interrupting ecosystems. Lastly, the stainless steel straw. BPA free and dishwasher safe, this straw is portable and durable. Not sure of the carbon foot print other than producing steel in factories. What kind of emissions? Are they recyclable? Can they be made from recycled steel? Now this PSA goes for plastic stirs as well. Ask for a spoon at the coffee shop, you know they have them. Be that annoying customer that refuses to use plastic, set an example. I try to bring some kid of a utensil with me wherever I go to avoid plastic only scenarios. Wooden stirs are compostable/biodegradable, but lets try to eliminate unnecessary waste all together. More plastic in the ocean than sea life by 2050 is not a good look people. 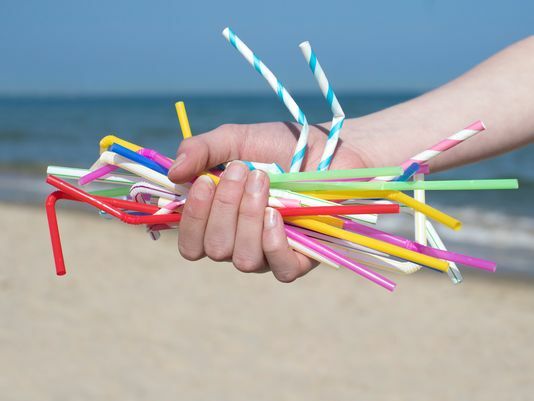 STRAWS CANNOT BE RECYCLED! I DON'T KNOW WHY, BUT STOP PRETENDING LIKE YOU ARE DOING THE RIGHT THING BY RECYCLING STUFF THAT CAN'T EVEN BE RECYCLED! True Story: I wanted to get some Kombucha on tap at a local coffee shop in town(so hipster, I know). I forgot my glass jar, as it was an impromtu trip, so I asked the barista if he could pour my Kombucha in a paper cup...world's shattered, I know! But he said SURE! Most cafes these days use recycled paper cups and at the very least, they can be composted and will biodegrade. I am not for cutting down more trees, however, if the only options are plastic and paper, I am going with the paper. Now, if I were staying at the cafe to drink in, I would have asked for it in a mug. 2nd True Story: I was in Beacon with a couple of friends looking for a coffee shop. Now I had already had my coffee and this time brought it with me in my glass jar. We stumbled into a tea shop, where these dudes make their own ginger ale and other tea blends(I know, even more hipster than the 1st story). Well they talked me into this Matcha Green Tea with Ginger(SO FREAKING HIPSTER!). I said yes, but only if he could pour it into my glass container. Not only did he say yes, but he rinsed out my glass jar for me! Moral of these stories: Nikki is crazy hipster and just ask your barista's to make your order plastic free. Not ever shop will do this, but it is worth the ask!